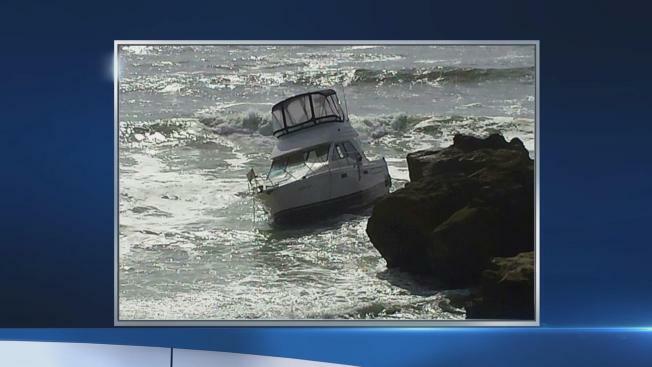 Five people evacuated from this boat after it hit a whale near Pescadero. - May 24, 2014. Five people safely evacuated a motorboat after colliding with a whale off the coast of Pescadero Saturday afternoon, according to the San Mateo County Sheriff's Office. At about 2:40 p.m., sheriff's deputies received a report that a boat had collided with a whale about five to ten miles from shore, San Mateo County Sheriff's Office spokeswoman Rebecca Rosenblatt said. Rosenblatt said the occupants of the boat reported seeing the whale and feeling their boat collide with it. The boat's engine was disabled during the collision and strong waves started pushing the vessel closer to the rocky coast. Once near the shore, all five boaters were able to disembark the vessel and get to dry land near Pebble Beach, Rosenblatt said. The San Mateo County Sheriff's Office assisted in getting a salvage company to the boat, which had been pushed up close to the rocks in the protected marine sanctuary, Rosenblatt said. Deputies and the salvage team are working to ensure the ecosystem is protected from possible gas or oil spillage during the salvage operation. Both the whale and the boaters appear to be uninjured, Rosenblatt said.